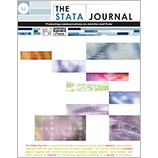 Home >> Archives >> Keyword search for ""
Stata Journal Volume 19 Number 1. D. Roodman, J. G. MacKinnon, M. Ø. Nielsen, and M. D. Webb. 2019. M. Jakubowski and A. Pokropek. 2019. M. D. Cattaneo, R. Titiunik, and G. Vazquez-Bare. 2019. N. J. Cox and C. B. Schechter. 2019. M. J. Grayling and A. P. Mander. 2018. R. Grotti and G. Cutuli. 2018. S. Bauldry, J. Xu, and A. S. Fullerton. 2018. D. Chetverikov, D. Kim, and D. Wilhelm. 2018. X. Ye and Y. Sun. 2018. N. J. Cox and C. B. Schechter. 2018. Stata Journal Volume 18 Number 3. V. Verardi and C. Vermandele. 2018. S. K. Metzger and B. T. Jones. 2018. J. Meekes and W. H. J. Hassink. 2018. G. Rovigatti and V. Mollisi. 2018. D. Clarke and B. Matta. 2018. L. Hong, G. Alfani, C. Gigliarano, and M. Bonetti. 2018. A. Chaimani, D. Mavridis, J. P. T. Higgins, G. Salanti, and I. R. White. 2018. R. Williams, P. D. Allison, and E. Moral-Benito. 2018. Stata Journal Volume 18 Number 2. J. A. Gallis, F. Li, H. Yu, and E. L. Turner. 2018. M. F. Dicle and B. Dicle. 2018. C. H. Righolt and S. M. Mahmud. 2018. M. Hernández-Alava and S. Pudney. 2018. M. J. Grayling, J. M. S. Wason, and A. P. Mander. 2018. C. H. Lee and D. G. Steigerwald. 2018. F. Pacicco, L. Vena, and A. Venegoni. 2018. Y. Xu and Y. B. Cheung. 2018. Stata Journal Volume 18 Number 1. J. Otero and C. F. Baum. 2018. B. Perrot, E. Bataille, and J.-B. Hardouin. 2018. L. A. Gray and M. Hernández Alava. 2018. O. Barriga Cabanillas, J. D. Michler, A. Michuda, and E. Tjernström. 2018. J. A. Cook and A. Rajbhandari. 2018. H. Herwartz, S. Maxand, F. H. C. Raters, and Y. M. Walle. 2018. F. Rios-Avila and G. Canavire-Bacarreza. 2018. D. Gallacher and F. Achana. 2018. M. D. Cattaneo, M. Jansson and X. Ma. 2018. Stata Journal Volume 17 Number 4. Y. Wei and P. Royston. 2017. S. Galiani and B. Quistorff. 2017. B. Rossi and M. Soupre. 2017. M. Schonlau, N. Guenther, and I. Sucholutsky. 2017. G. Zhu, Z. Du, and J. C. Escanciano. 2017. S. Weber and M. Péclat. 2017. L. Lopez and S. Weber. 2017. J. Otero and C. F. Baum. 2017. G. Nattino, S. Lemeshow, G. Phillips, S. Finazzi, and G. Bertolini. 2017. M. Cattaneo, P. Malighetti, and D. Spinelli. 2017. M. Cruz-Gonzalez, I. Fernández-Val, and M. Weidner. 2017. Stata Journal Volume 17 Number 3. R. A. Hughes, M. G. Kenward, J. A. C. Sterne, and K. Tilling. 2017. M. W. Fagerland and D. W. Hosmer. 2017. D. Pacifico and F. Poege. 2017. J. Otero and J. Smith. 2017. C. F. Manski and M. Tabord-Meehan. 2017. M. F. Dicle and J. D. Levendis. 2017. Stata Journal Volume 17 Number 2. E. J. Daza, M. G. Hudgens, and A. H. Herring. 2017. D. Christodoulou and V. Sarafidis. 2017. R. L. Grant, B. Carpenter, D. C. Furr, and A. Gelman. 2017. R. L. Grant, D. C. Furr, B. Carpenter, and A. Gelman. 2017. A. Discacciati and M. Bottai. 2017. S. Calonico, M. D. Cattaneo, M. H. Farrell, and R. Titiunik. 2017. S. I. Mozumder, M. J. Rutherford, and P. C. Lambert. 2017. E. Lorenz and S. Gabrysch. 2017. Stata Journal Volume 17 Number 1. D. W. K. Andrews, W. Kim, and X. Shi. 2017. R. Schunck and F. Perales. 2017. T. Erickson, R. Parham, and T. M. Whited. 2017. S. T. Lirette, S. R. Seals, C. Blackshear, and W. May. 2017. F. Belotti, G. Hughes, and A. Piano Mortari. 2017. P. Taffé, M. Peng, V. Stagg, and T. Williamson. 2017. M. Menon, F. Perali, and N. Tommasi. 2017. P. Corral, D. Kuehn, and E. Jabir. 2017. Stata Journal Volume 16 Number 4. O. Sauzet and M. Kleine. 2016. M. Manjón and J. Mañez. 2016. N. Guenther and M. Schonlau. 2016. H. Bower, M. J. Crowther, and P. C. Lambert. 2016. J. Alejo, A. Bera, A. Galvao, G. Montes-Rojas, and Z. Xiao. 2016. M. Keane and T. Neal. 2016. O. Badunenko and P. Mozharovskyi. 2016. A. Andersen and A. Rieckmann. 2016. J. M. Ramos-Goñi and Y. Ramallo-Fariña. 2016. A. Cronin, L. Tian, and H. Uno. 2016. T. del Barrio Castro, A. Bodnar, and A. Sansó. 2016. M. P. Babington and J. Cano-Urbina. 2016. M. R. M. Abrigo and I. Love. 2016. Stata Journal Volume 16 Number 2. X. Xu and J. W. Hardin. 2016. Y. Xu, P. Milligan, E. J. Remarque, and Y. B. Cheung. 2016. M. D. Cattaneo, R. Titiunik, and G. Vazquez-Bare. 2016. S. Huber and C. Rust. 2016. T. Burdisso and M. Sangiácomo. 2016. S. Cro, T. P. Morris, M. G. Kenward, and J. R. Carpenter. 2016. J.-F. Hamel, V. Sébille, G. Challet-Bouju, and J.-B. Hardouin. 2016. C. F. Baum and S. Bibo. 2016. Stata Journal Volume 16 Number 1. J. S. Long and D. M. Drukker. 2016. P. Royston and W. Sauerbrei. 2016. B. Choodari-Oskooei and T. P. Morris. 2016. O. O'Donnell, S. O'Neill, T. Van Ourti, and B. Walsh. 2016. K. Arzheimer and J. Evans. 2016. M. Hernández-Alava and S. Pudney. 2016. Features of the area under the receiver operating characteristic (ROC) curve. A good practice. D. Lora, I. Contador, J. F. Pérez-Regadera, and A. Gómez de la Cámara. 2016. M. Sarzosa and S. Urzúa. 2016. K. Hemming and A. Girling. 2016. Stata Journal Volume 15 Number 4. A. Chaimani and G. Salanti. 2015. I. De Vos, G. Everaert, and I. Ruyssen. 2015. C. Lindsey and S. Sheather. 2015. C. Bascoul-Mollevi, F. Castan, D. Azria, and S. Gourgou-Bourgade. 2015. M. E. Bontempi and I. Mammi. 2015. Stata Journal Volume 15 Number 3. C. L. Skeels and L. W. Taylor. 2015. T. M. Palmer and J. A. C. Sterne. 2015. N. Wasi and A. Flaaen. 2015. S. Chen, J. Rolfes, and H. Zhao. 2015. A. Discacciati, N. Orsini, and S. Greenland. 2015. M. Hernández Alava and A. Wailoo. 2015. L. J. Scott and C. A. Rogers. 2015. R. Mora and I. Reggio. 2015. M. Overgaard, P. K. Andersen, and E. T. Parner. 2015. J. Alejo, A. Galvao, G. Montes-Rojas, and W. Sosa-Escudero. 2015. P. Gluzmann and D. Panigo. 2015. Stata Journal Volume 15 Number 2. D. J. Bratton, B. Choodari-Oskooei, and P. Royston. 2015. I. McCarthy, D. L. Millimet, and M. Roy. 2015. J. W. Bartlett and T. P. Morris. 2015. T. H. Cummings, J. W. Hardin, A. C. McLain, J. R. Hussey, K. J. Bennett, and G. M. Wingood. 2015. P. Corral and M. Terbish. 2015. T. S. L. Brophy, R. C. Daniels, and S. Musundwa. 2015. A. Zlotnik and V. Abraira. 2015. S. Lecocq and J.-M. Robin. 2015. Stata Journal Volume 15 Number 1. F. Belotti, P. Deb, W. G. Manning, and E. C. Norton. 2015. V. Chernozhukov, W. Kim, S. Lee, and A. Rosen. 2015. G. L. Lo Magno. 2015. W. Gelade, V. Verardi, and C. Vermandele. 2015. B. M. Fellman and Y. Yuan. 2015. Y. Xu and Y. B. Cheung. 2015. E. Coviello, P. W. Dickman, K. Seppä, and A. Pokhrel. 2015. P. W. Dickman and E. Coviello. 2015. C. E. Pflueger and S. Wang. 2015. J. W. Hardin and J. M. Hilbe. 2015. C. Criscuolo, P. N. Gal, and C. Menon. 2015. Stata Journal Volume 14 Number 4. T. Bartus and D. Roodman. 2014. C. Engel and P. G. Moffatt. 2014. M. Manjón and O. Martínez. 2014. U. Williams and S. P. Williams. 2014. F. Wendelspiess Chávez Juárez and I. Soloaga. 2014. K. M. Aloisio, N. Micali, S. A. Swanson, A. Field, and N. J. Horton. 2014. S. Calonico, M. D. Cattaneo, and R. Titiunik. 2014. J. D. Wolfe and S. Bauldry. 2014. Stata Journal Volume 14 Number 3. V. K. Bostwick and D. G. Steigerwald. 2014. B. M. Fellman and J. Ensor. 2014. J. Björnerstedt and F. Verboven. 2014. T. Harris, J. M. Hilbe, and J. W. Hardin. 2014. M. Bia, C. A. Flores, A. Flores-Lagunes, A. Mattei. 2014. M. Bia and P. Van Kerm. 2014. I. McCarthy, D. Millimet, and R. Tchernis. 2014. J. Luedicke and A. Bernacchia. 2014. Stata Journal Volume 14 Number 2. J. W. Hardin and J. M. Hilbe. 2014. A. Vexler, H. Tanajian, and A. D. Hutson. 2014. K. Hemming and A. Girling. 2014. X. Zhang and C. Li. 2014. M. R. Ansari, C. Mussida, and F. Pastore. 2014. C. Welch, J. Bartlett, and I. Petersen. 2014. Stata Journal Volume 14 Number 1. B. Miladinovic, I. Hozo, A. Chaimani, and B. Djulbegovic. 2014. I. Clerc-Urmès, M. Grzebyk, and G. Hédelin. 2014. R. J. A. Cámara. 2014. T. M. Palmer, C. M. Macdonald-Wallis, D. A. Lawlor, and K. Tilling. 2014. B. Guardabascio and M. Ventura. 2014. E. Batistatou, C. Roberts, and S. Roberts. 2014. M. Hills, B. Rachet, and M. Falcaro. 2014. S. Brave and T. Walstrum. 2014. Stata Journal Volume 13 Number 4. F. Belotti, S. Daidone, G. Ilardi, and V. Atella. 2013. S. R. Hinchliffe, D. A. Scott, and P. C. Lambert. 2013. B. A. Desmarais and J. J. Harden. 2013. Z. L. Flynn and L. M. Magnusson. 2013. C. H. Salas Pauliac. 2013. M. Cattaneo, D. Drukker, and A. Holland. 2013. Stata Journal Volume 13 Number 3. M. J. Crowther, S. R. Hinchliffe, A. Donald, and A. J. Sutton. 2013. J. Ramos-Goñi, O. Rivero-Arias, and H. Dakin. 2013. E. C. Norton, M. M. Miller, and L. C. Kleinman. 2013. A. Riquelme, D. Berkowitz, and M. Caner. 2013. E. Kontopantelis and D. Reeves. 2013. J. R. Blevins and S. Khan. 2013. D. Pacifico and H. Yoo. 2013. D. M. Drukker, I. R. Prucha, and R. Raciborski. 2013. Stata Journal Volume 13 Number 2. D. M. Drukker, H. Peng, I. R. Prucha, and R. Raciborski. 2013. M. Bottai and N. Orsini. 2013. B. Dicle, J. Levendis, and M. F. Dicle. 2013. D. E. Cook, K. R. Ryckman, and J. C. Murray. 2013. F. Libois and V. Verardi. 2013. T. Harris and J. W. Hardin. 2013. S. R. Hinchliffe and P. C. Lambert. 2013. R. Bellocco and S. Algeri. 2013. S. I. Vidmar, T. J. Cole, and H. Pan. 2013. Y. Gu, A. R. Hole, and S. Knox. 2013. T. Wimberley, E. Parner, and H. Stovring. 2013. G. L. Lo Magno. 2013. B. Miladinovic, I. Hozo, and B. Djulbegovic. 2013. K. Hemming and J. Marsh. 2013. M. F. Dicle and J. Levendis. 2013. E. S.-W. Ng, R. Grieve, and J. R. Carpenter. 2013. M. J. Crowther, K. R. Abrams, and P. C. Lambert. 2013. N. Orsini, R. Bellocco, and A. Sjölander. 2013. V. Dardanoni, G. De Luca, S. Modica, and F. Peracchi. 2012. M. J. Crowther, D. Langan, and A. J. Sutton. 2012. T. M.-L. Andersson and P. C. Lambert. 2012. M. J. Crowther and P. C. Lambert. 2012. D. Consonni, E. Coviello, C. Buzzoni, and C. Mensi. 2012. L. Quintó, S. Sanz, E. De Lazzari, and J. J. Aponte. 2012. B. T. West and S. E. McCabe. 2012. V. Verardi and N. Debarsy. 2012. T. Harris, Z. Yang, and J. W. Hardin. 2012. W. Eddings and Y. Marchenko. 2012. Stata Journal Volume 12 Number 3. U. Kohler and J. Zeh. 2012. I. Almås, T. Havnes, and M. Mogstad. 2012. D. F. McCaffrey, J. R. Lockwood, K. Mihaly, and T. R. Sass. 2012. M. W. Fagerland and D. W. Hosmer. 2012. M. F. Dicle and B. Dicle. 2012. Q. Wang and N. Wu. 2012. R. Desbordes and V. Verardi. 2012. Stata Journal Volume 12 Number 2. What hypotheses do “nonparametric” two-group tests actually test? T. Xiao, G. A. Whitmore, X. He, and M.-L. T. Lee. 2012. V. Verardi and A. McCathie. 2012. Stata Journal Volume 12 Number 1. M. Schonlau and E. Liebau. 2012. S. J. Samuels and N. J. Cox. 2012. R. M. Daniel, B. L. De Stavola, and S. N. Cousens. 2011. Stata Journal Volume 11 Number 4. G. De Luca and J. R. Magnus. 2011. G. K. Brown and T. Mergoupis. 2011. D. A. Powers, H. Yoshioka, and M.-S. Yun. 2011. L. K. Williams and G. D. Whitten. 2011. R. Hicks and D. Tingley. 2011. M. F. Dicle and J. Levendis. 2011. U. Kohler and S. Eckman. 2011. N. Orsini and M. Bottai. 2011. Stata Journal Volume 11 Number 3. T. M. Palmer, R. R. Ramsahai, V. Didelez, and N. A. Sheehan. 2011. M. Lokshin and Z. Sajaia. 2011. M. P. Caria, R. Bellocco, M. R. Galanti, and N. J. Horton. 2011. D. A. Wagstaff and O. Harel. 2011. U. Kohler, K. B. Karlson, and A. Holm. 2011. A. Doris, D. O'Neill, and O. Sweetman. 2011. Stata Journal Volume 11 Number 2. J. M. C. Santos Silva and S. Tenreyro. 2011. G. De Luca and V. Perotti. 2011. C. U. Kunz and M. Kieser. 2011. P. Tebaldi, M. Bonetti, and M. Pagano. 2011. W. Gould and N. J. Cox. 2011. N. Orsini and S. Greenland. 2011. Stata Journal Volume 11 Number 1. J.-B. Hardouin, A. Bonnaud-Antignac, and V. Sébille. 2011. A. Ozimek and D. Miles. 2011. J. M. Ramos-Goñi and O. Rivero-Arias. 2011. T. Boswell and R. G. Gutierrez. 2011. Y. V. Marchenko and M. G. Genton. 2010. Stata Journal Volume 10 Number 4. E. Neumayer and T. Plümper. 2010. M. J. Rutherford, P. C. Lambert, and J. R. Thompson. 2010. P. Guimarães and P. Portugal. 2010. C. Lindsey and S. Sheather. 2010. Stata Journal Volume 10 Number 3. J. C. Huber Jr.. 2010. P. Royston and F. M.-S. Barthel. 2010. E. Kontopantelis and D. Reeves. 2010. E. T. Parner and P. K. Andersen. 2010. M. Frölich and B. Melly. 2010. F. Belotti and D. Depalo. 2010. Stata Journal Volume 10 Number 2. N. Pantazis and G. Touloumi. 2010. J. Muro, C. Suárez, and M. Zamora. 2010. V. Verardi and C. Dehon. 2010. Y. Ji and C. Lee. 2010. Stata Journal Volume 10 Number 1. B. Jann and J. S. Long. 2010. M. Falcaro and A. Pickles. 2010. K. Mihaly, D. F. McCaffrey, J. R. Lockwood, and T. R. Sass. 2010. F. M.-S. Barthel, P. Royston, and M. K. B. Parmar. 2009. Stata Journal Volume 9 Number 4. M. Blackwell, S. Iacus, G. King, and G. Porro. 2009. P. Royston and W. Sauerbrei. 2009. T. Cornelißen and K. Sonderhof. 2009. M. L. Buis and M. Weiss. 2009. Stata Journal Volume 9 Number 3. Y. V. Marchenko and J. P. Reiter. 2009. K. Finlay and L. M. Magnusson. 2009. V. Verardi and C. Croux. 2009. S. J. Goerg and J. Kaiser. 2009. Stata Journal Volume 9 Number 2. R. M. Harbord, R. J. Harris, and J. A. C. Sterne. 2009. R. M. Harbord and P. Whiting. 2009. P. Royston, J. B. Carlin, and I. R. White. 2009. P. C. Lambert and P. Royston. 2009. M. Chatfield and A. Mander. 2009. M. S. Pepe, G. Longton, and H. Janes. 2009. Stata Journal Volume 9 Number 1. H. Janes, G. Longton and M. S. Pepe. 2009. I. R. White and J. P. T. Higgins. 2009. J. Kaiser and M. G. Lacy. 2009. C. F. Baum and T. Linz. 2009. Stata tip 73: append with care! R. G. Gutierrez and P. A. Lachenbruch. 2009. Stata Journal Volume 8 Number 4. M. Sinning, M. Hahn, and T. K. Bauer. 2008. R. M. Harbord and J. P. T. Higgins. 2008. B. T. West, P. Berglund, and S. G. Heeringa. 2008. N. J. Cox and G. M. Longton. 2008. Y. V. Marchenko, R. J. Carroll, D. Y. Lin, C. I. Amos, and R. G. Gutierrez. 2008. Stata Journal Volume 8 Number 3. R. Emsley, M. Lunt, A. Pickles, and G. Dunn. 2008. M. Bia and A. Mattei. 2008. M. Lokshin and Z. Sajaia. 2008. J. Herrin and E. Poen. 2008. Stata Journal Volume 8 Number 2. M. Yasar, R. Raciborski, and B. Poi. 2008. D. Persyn and J. Westerlund. 2008. T. M. Palmer, J. L. Peters, A. J. Sutton, and S. G. Moreno. 2008. N. J. Cox and N. L. M. Barlow. 2008. Stata Journal Volume 8 Number 1. R. Harris, M. Bradburn, J. Deeks, R. Harbord, D. Altman, and J. Sterne. 2008. N. Orsini, R. Bellocco, M. Bottai, A. Wolk, and S. Greenland. 2008. J. B. Carlin, J. C. Galati, and P. Royston. 2008. W. Sosa-Escudero and A. K. Bera. 2008. K. C. Longest and S. Vaisey. 2008. Stata Journal Volume 7 Number 4. C. F. Baum, M. E. Schaffer, and S. Stillman. 2007. Stata tip 53: Where did my p–values go? Stata Journal Volume 7 Number 3. X. Zheng and S. Rabe-Hesketh. 2007. J. Shults, S. J. Ratcliffe, and M. Leonard. 2007. Stata Journal Volume 7 Number 2. R. Chiburis and M. Lokshin. 2007. E. F. Blackburne and M. W. Frank. 2007. C. F. Baum and N. J. Cox. 2007. F. Kreuter and R. Valliant. 2007. Stata Journal Volume 7 Number 1. P. Royston and W. Sauerbrei. 2007. S. O. Becker and M. Caliendo. 2007. P. Vittorini, S. Necozione, and F. di Orio. 2007. C. Brzinsky-Fay, U. Kohler, and M. Luniak. 2006. Stata Journal Volume 6 Number 4. M. Andrews, T. Schank, and R. Upward. 2006. R. E. De Hoyos and V. Sarafidis. 2006. J. Thompson, T. Palmer, and S. Moreno. 2006. Stata tip 39: In a list or out? In a range or out? A. Miranda and S. Rabe-Hesketh. 2006. Stata Journal Volume 6 Number 3. A. Mikusheva and B. P. Poi. 2006. F. M.-S. Barthel and P. Royston. 2006. Stata tip 36: Which observations? Stata Journal Volume 6 Number 2. L. Cappellari and S. P. Jenkins. 2006. D. M. Drukker and R. Gates. 2006. P. Haan and A. Uhlendorff. 2006. P. Deb and P. K. Trivedi. 2006. Stata Journal Volume 6 Number 1. R. Gini and J. Pasquini. 2006. N. Orsini, R. Bellocco, and S. Greenland. 2006. K. J. Archer and S. Lemeshow. 2006. G. S. F. Bruno. 2005. Stata Journal Volume 5 Number 4. J. Xu and J. S. Long. 2005. U. Kohler and C. Brzinsky-Fay. 2005. Stata Journal Volume 5 Number 3. N. Orsini, D. Rizzuto, and N. Nante. 2005. W. D. Dupont and W. D. Plummer, Jr.. 2005. P. Royston and N. J. Cox. 2005. D. Kantor and N. J. Cox. 2005. Stata Journal Volume 5 Number 2. J. L. Blackwell, III. 2005. U. Kohler and M. Luniak. 2005. S. Lemeshow and M. L. Moeschberger. 2005. Stata Journal Volume 5 Number 1. Stata: The language of choice for time–series analysis? M. N. Mitchell and X. Chen. 2005. F. M.-S. Barthel, P. Royston, and A. Babiker. 2005. Stata Journal Volume 4 Number 4. Z. Fewell, M. A. Hernán, F. Wolfe, K. Tilling, H. Choi, J. A. C. Sterne. 2004. M. Bottai and N. Orsini. 2004. Stata Journal Volume 4 Number 3. L. G. Kim and I. R. White. 2004. P. Cummings and B. McKnight. 2004. M. Lokshin and Z. Sajaia. 2004. A. Abadie, D. Drukker, J. L. Herr, and G. W. Imbens. 2004. P. Ryan and N. Winter. 2004. V. Coviello and M. Boggess. 2004. Stata Journal Volume 4 Number 2. A. Petrin, B. P. Poi, and J. Levinsohn. 2004. J. A. C. Sterne and R. M. Harbord. 2004. D. A. Harrison and A. R. Brady. 2004. E. C. Norton, H. Wang, and C. Ai. 2004. S. Driver and P. Royston. 2004. Stata Journal Volume 4 Number 1. S. Vidmar, J. Carlin, K. Hesketh, and T. Cole. 2004. J. M. Linhart, J. S. Pitblado, and J. Hassell. 2004. Stata Journal Volume 3 Number 4. J. W. Hardin and R. J. Carroll. 2003. J. W. Hardin, H. Schmiediche, and R. J. Carroll. 2003. S. Rabe-Hesketh, A. Skrondal, and A. Pickles. 2003. R. G. Gutierrez, J. M. Linhart, and J. S. Pitblado. 2003. S. M. Hailpern and P. F. Visintainer. 2003. Stata Journal Volume 3 Number 3. J. B. Carlin, N. Li, P. Greenwood, and C. Coffey. 2003. N. Smeeton and N. J. Cox. 2003. L. Cappellari and S. P. Jenkins. 2003. H. J. Newton and N. J. Cox. 2003. Stata Journal Volume 3 Number 2. R. Newson and the ALSPAC Study Team. 2003. I. H. Salgado-Ugarte and M. A. Pérez-Hernández. 2003. O. M. G. Keshk. 2003. C. F. Baum, M. E. Schaffer, and S. Stillman. 2003. Stata Journal Volume 3 Number 1. G. Rodríguez and I. Elo. 2003. C. L. Saunders, D. T. Bishop, and J. H. Barrett. 2003. M. J. Moreira and B. P. Poi. 2003. N. J. Cox and U. Kohler. 2003. D. W. Hosmer and P. Royston. 2002. Stata Journal Volume 2 Number 4. S.O. Becker and A. Ichino. 2002. W. Guan & R. G. Gutierrez. 2002. Stata Journal Volume 2 Number 3. M. E. Reichenheim and A. Ponce de Leon. 2002. Stata Journal Volume 2 Number 2. I. R. White, S. Walker, and A. Babiker. 2002. P. Royston and A. Babiker. 2002. J. A. C. Sterne and K. Tilling. 2002. T. J. Steichen and N. J. Cox. 2002. A. McDowell and J. Pitblado. 2002. S. Rabe-Hesketh, A. Skrondal, and A. Pickles. 2002. Stata Journal Volume 2 Number 1. Stata Journal Volume 1 Number 1. J. S. Long and J. Freese. 2001. P. Van Kerm and Stephen P. Jenkins. 2001.